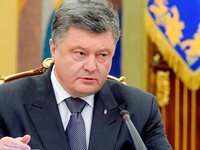 Ukrainian President Petro Poroshenko has said that Ukraine will never become a federalized and that after the amendments to the constitution are made, the country will remain a unitary state. "It's very important that Donbas representatives take part in developing these constitutional amendments… It's very important that numerous polls support our idea of complete unacceptability of the federalization. After these constitutional amendments on decentralization, Ukraine will remain a unitary state. And that's why we can't have any compromises," Poroshenko said at a meeting of the Constitutional Commission in Kyiv on Friday.